Now, perhaps none of this would matter very much if it were a subscription magazine where alternative medicine cranks could get their monthly fix of drivel and the rest of us didn’t have to worry about it too much. But I think it does matter when respectable high street retailers stock the magazine. That makes it look like a respectable source of health advice, rather than the crazy conspiracy theory nonsense that it is. If someone walking into a respectable retailer saw this magazine in their “health” section, then they might think it is something to be taken seriously. The consequences of that could be tragic. Beyond Positive have written eloquently about the dangers of persons living with HIV being exposed to such dangerous advice. Sainsburys briefly stocked the magazine, but to their credit, they have since withdrawn it from sale after it was pointed out to them just how dangerous the magazine is. Tesco, however, is another matter. They continue to stock the magazine. I understand you have concerns over the magazine, What Doctors Don’t Tell You, and I can appreciate your views on the matter. We are in the position of offering our customers choice rather than appointing ourselves as censors or moral guardians. The publisher of this magazine prints on page 3 a liability statement advising readers to consult a qualified practitioner before undertaking any treatment. While we cannot comment on the contents of these magazines, your comments have been duly noted and fed back to our Buying Teams. One thing to note in passing is that their claim not to act as “censors or moral guardians” is obviously not true. Acting as censors and moral guardians is exactly what they did about “lads’ mags” and a rather offensive Halloween costume. I did try asking them why they sometimes act as censors and moral guardians and sometimes don’t on their Facebook page. They initially replied simply to say that they had removed the Halloween costume from sale (which I already knew) and completely failed to answer my question, which does suggest that the people Tesco put in the position of interacting with the public are not exactly completely engaged in their role. When I pointed out that they hadn’t answered my question, they replied again to promise that they’d get back to me, but of course they never did. 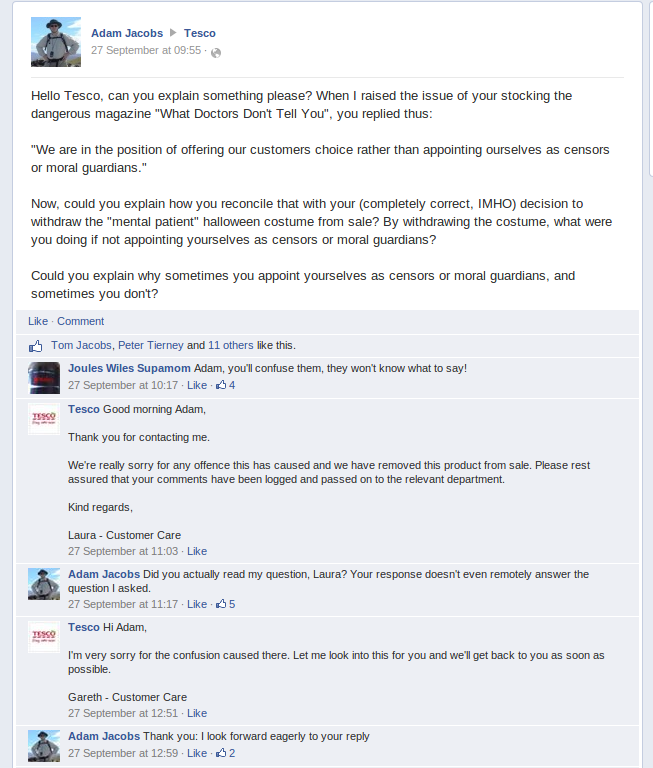 I also raised my concerns specifically about the magazine on Tesco’s Facebook page, but alas all I got was the same template response that others had got. I see that you have a clear policy about helping your customers to make healthy choices. That is admirable, but it seems that one of your purchasing decisions is really not living up to it. I gather that you sell "What doctors don't tell you" in your magazine sections. This magazine is dangerous. It consists of much health misinformation (for example, advice to avoid life-saving vaccinations against diseases such as measles or whooping cough), and if any of your customers were unfortunate enough to believe the articles in it, then their health could be put seriously at risk. There is a good reason why doctors don't tell you most of the stuff you read in that magazine, in much the same way that car mechanics don't tell you to care for your car's bodywork by regularly driving through salt water. I urge you to reconsider your decision to sell the magazine, as it seems to be in clear breach of your CSR policy on helping your customers to live healthy lives. As I'm sure you're all too aware, CSR policies are often regarded with some cynicism as mere window dressing, not backed up by any meaningful action. This is your chance to prove otherwise! Tesco’s corporate responsibility team did not respond. I understand you have concerns over the magazine, What Doctors Don't Tell You, and I can appreciate your views on the matter. There followed much frustrating to-and-fro, both by email and on Facebook, while I asked them if I could have a reply from their corporate responsibility department. Mostly, they simply didn’t understand the question. Eventually, however, we seemed to make progress. On Facebook, I was told that the corporate responsibility team would not reply to me directly, but would simply send the standard response from customer services that everyone else sent, because they like to ensure that their replies are consistent. I would like to advise that in order for you to contact our Corporate responsibility team you would have to put it in writing to our Head Office in Cheshunt and the address is as follows. So much for consistent replies. Well, I did indeed do as Stephen suggested and I wrote an old-fashioned letter on a real piece of paper and put it in the post. That was getting on for 4 weeks ago, and I haven’t had a reply. I don’t honestly expect to get one. Now, I dare say that Tesco’s corporate responsibility team have other things to worry about. Trying to make sure that not too many of the people who make their clothes in sweatshops in Bangladesh get killed in unsafe working conditions probably keeps them quite busy. They probably also need to spend a certain amount of time figuring out what kind of farm animals are in their ready meals and just how dishonestly to respond when they’re caught selling the wrong kind. But still, it’s now about 2 months since I first contacted them. Is it really too much to expect a brief reply? Perhaps Tesco don’t see this as a corporate responsibility issue. Well, that’s their prerogative, but I don’t see why someone in their corporate responsibility department couldn’t at least have taken the trouble to spend 5 minutes writing an email to say so. Can we really take Tesco’s commitments to corporate responsibility seriously if their corporate responsibility department so completely fails to engage with members of the public? I do wonder whether their corporate responsibility department even exists. On Twitter, Tesco assured me that it did, but I have yet to see any evidence of that. Certainly never got the promised reply. To my mind, this is absolutely a corporate responsibility issue. By selling WDDTY, Tesco are giving it a stamp of respectability. This is not about “free speech” or whether anyone is trying to “ban” WDDTY, despite some folks’ attempts to paint it that way (those arguments have been dealt with comprehensively by Matthew Lam and Andy Lewis). It’s about whether it’s responsible for retailers such as Tesco to give WDDTY an implicit stamp of approval. Anyone taken in by that false impression of credibility could be harmed, and I don’t think that’s a responsible way for Tesco to act. I originally said that Sainsbury's had, to their credit, decided to stop selling the magazine after a trial period. It turns out they were lying when they said they were no longer going to sell it. They also continue to sell it. 8 responses to "WDDTY and Tesco's corporate irresponsibility"
"You will receive a reply after your letter has been received and reviewed by the team." To me, the level of bias and misinformation in this article is far worse than the magazine it purports to criticise. What nobody here seems to apprehend is that there is not a level playing field for natural and alternative medicine. Substantive randomised clinical trials cost millions of pounds to undertake, and as natural products cannot be patented such an undertaking cannot be contemplated, as there is simply no-way to recoup the massive investment needed. If you want to wait until the benefits of Echinacea have been completely substantiated, go right ahead. For me, I prefer to make my own mind-up and live healthily and happily now, thank you very much. I’ve now cured and reversed every condition from IBS to heart disease. I literally owe my life to natural medicine – and have often been led toward the cure by articles such as those you are so ready to criticise and condemn. Call me crazy – but I believe articles like these are doing more good for the health and wellbeing of our nation than the entire medical establishment combined (who admittedly do much good). And I will continue to invest my money and my faith in natural remedies – because they work – full stop. A fact which is a far cry from the barrage of synthetic chemicals produced by corrupt drug companies which are deliberately designed to do nothing more than mask and ameliorate the symptoms of disease. If you care for your health and that of your loved ones, I sincerely hope you leave your bias under you seat long enough to discover this happy truth for yourself. You say that there is misinformation in my article. Is there anything specific you can point to that isn't true? I think you may be misunderstanding how science works. I'm very pleased that your bronchitis has gone away, but I'm afraid that doesn't really prove that the echinacea was responsible. To do that, you would need large randomised trials. Echinacea is an interesting example for you to choose. You say that it's hard to do large randomised trials for natural products, and for the most part, that's true. However, echinacea is an example of a herbal product for which a large randomised trial has been done. And guess what? It showed that it doesn't work. Anyway, if you believe echinacea helps you, then go right ahead and keep taking it. I'm sure whoever is selling it to you is very grateful. Just realise that you are wasting your money. I also used to suffer from bronchitis every year starting in late September or early October. It was really very bad. For around ten years I'd struggle with it and it was massively annoying. Then two years ago it stopped. I wasn't taking any medicinal products relating to any other conditions, so it could not have been through a side effect from another drug. I cannot think that there are any relevant behavioural or environmental factors either. Which leads me to address your assertion that this herb is the reason for the cessation of your bronchitis. It is entirely possible that your bronchitis was cured by Echinacea. But it is also possible that it was not. There is no way of knowing with any shred of certainty. You are able to conjure up faith in alternative medicine, and in so doing are able to discount concepts such as proof and evidence. Other people are different and are not able to do so. Other people require objectivity, solidity and reason. I'm not saying that either is wrong necessarily. Your bar is set not higher or lower than others, just in another dimension entirely. It's kind of like the difference between people with faith and people without faith. Religious believers don't require proof that their chosen God exists. They have faith and that's good enough for them. (I quite admire this, as the concept of faith in the unseen is entirely alien to me.) Other people wouldn't subscribe to a religion if you placed a gun to their head. People are wired differently and I cannot see how your views stated above could ever be compatible with someone who prioritises evidence and proof. 1) Sceptics - when you know you're in the right, try to be less preachy and self-righteous - if you're in the right then what you're saying will speak for itself. I'm not surprised believers get so irate in their responses to you. There's also a bit of a mob mentality to these things that can come across as unseemly. 2) Believers - I know you don't prioritise evidence as much as other people, but you so often make assertions about people's articles that are incorrect. There is no misinformation in Adam's blog post. Your viewpoints are incompatible with each other from the start. State your points and make an argument, but making incorrect assertions only serves to make your fanciful viewpoints all the easier to dismiss. Seems we can't let the general public make their own minds up about health choices unless it's drug A or drug B, eh? Informed choice is what it's about: it seems disinformation is fine when a Registrar in a neonatal ward tells my son's mother it's fine to breastfeed when taking a drug (we read the paperwork once at home and had time to research the drug- the manufacturer stated it's NOT ok). When it comes to honey to help a cough versus a cough linctus apparently were crazy to even think of using a safe, natural remedy are we? Keep it up mate; and keep your shares in GSK etc nice and healthy. Yes, Ed, informed choice is indeed what it's about. And that's why WDDTY is a problem. It makes informed choice less likely by providing misinformation.